Fig. 3-1-3-1 shows the percent distribution by suspect's nationality, etc. 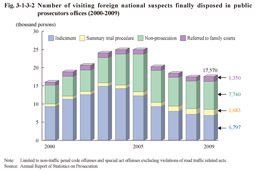 of visiting foreign national suspects (limited to non-traffic penal code offenses and special act offenses but excluding violations of road traffic related acts; hereinafter the same in this section) newly received by public prosecutors offices in 2009. By region of their origin Asia accounted for 79.3%. By their nationality, etc., China (including Hong Kong and Taiwan; hereinafter the same in Subsections 3 and 4) was the highest in proportion (34.2%), followed by North/South Korea (17.9%), the Philippines (9.6%), Brazil (8.7%), and Vietnam (5.2%). Fig. 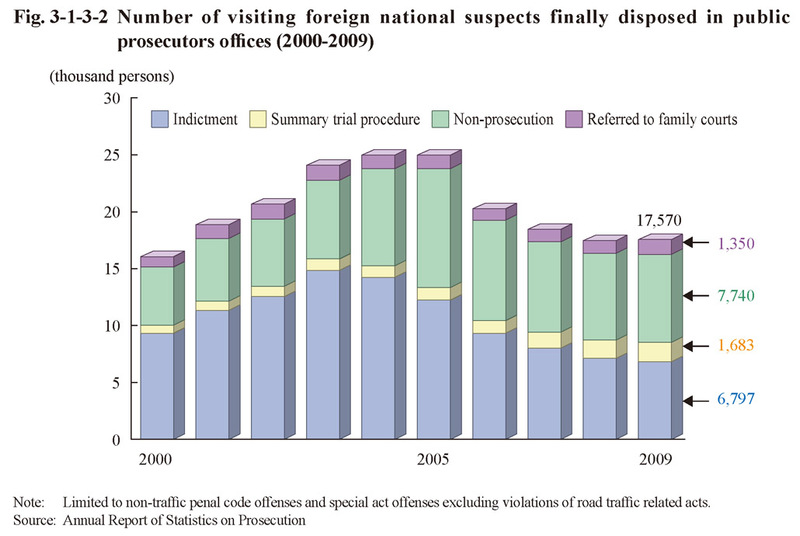 3-1-3-2 shows the number of visiting foreign national suspects finally disposed by public prosecutors over the last 10 years. The number continued to decrease every year from 2005 but increased slightly in 2009 from the previous year to 17,570 (up 0.4% from the previous year). 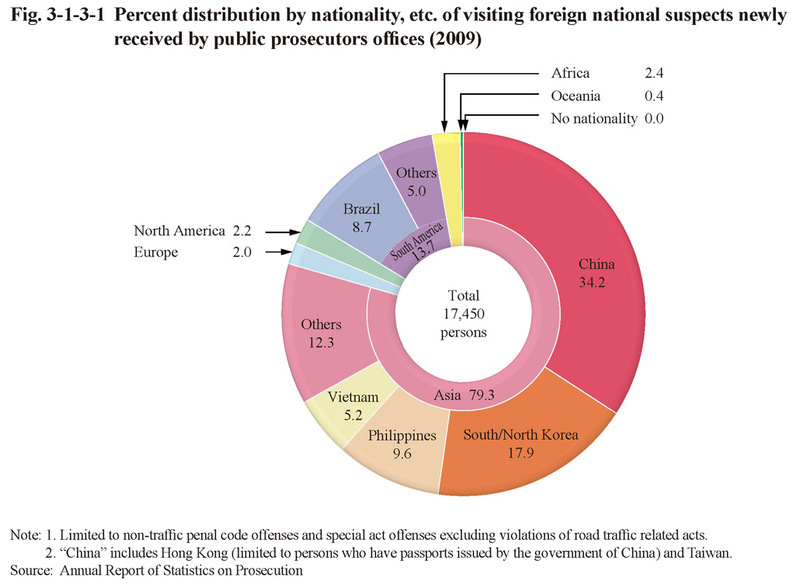 In 2009, the number of visiting foreign national suspects finally disposed by public prosecutors accounted for 4.1% and 82.8% of the total numbers of suspects finally disposed (432,683) and foreign national suspects finally disposed (21,226), respectively. 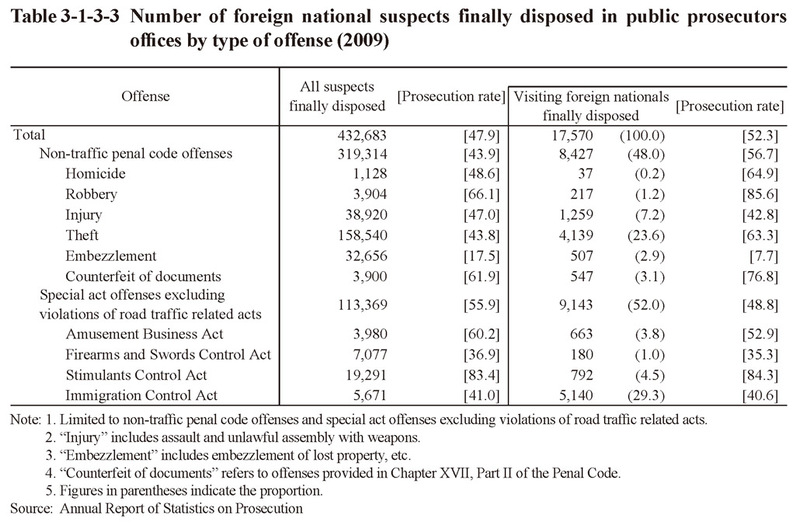 Table 3-1-3-3 shows the number of visiting foreign national suspects finally disposed in public prosecutors offices in 2009 by type of offense. Theft was the highest in proportion of non-traffic penal code offenses, followed by injury (including assault and unlawful assembly with weapons), counterfeit of documents (refers to offenses stipulated in Chapter XVII, Part II of the Penal Code), and embezzlement (including embezzlement of lost property, etc.). 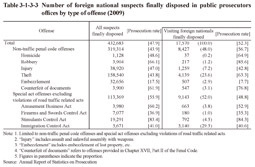 Compared to the prosecution rate of all suspects finally disposed for respective offenses, the prosecution rate of visiting foreign national suspects was 12.7 points higher for non-traffic penal code offenses, 7.1 points lower for special act offenses, and 2.8 points higher for special act offenses excluding Immigration Control Act violations.